Weeks after John Fitzgerald Kennedy beat Richard Nixon in the 1960 United States presidential election, an elderly man nearly killed the President-Elect. Richard Pavlick, a disturbed man with anti-Catholic sentiments, packed his car and traveled from New Hampshire to Florida with one goal in mind - the death of President-Elect Kennedy. Pavlick's brute force plan would likely have succeeded, but a moment of compassion stopped Pavlick in his tracks and allowed for the era of Camelot to begin. Retired postal worker Richard Pavlick often voiced anti-Catholic sentiments in his New Hampshire community, feeling that Kennedy used his family's fortune to buy the 1960 election. Pavlick drew the attention of a local postmaster, Thomas Murphyn when he abandoned his home and began to send Murphy postcards from a number of spots across the United States, sites corresponding with public appearances made by JFK. On the morning of December 11th, 1960, just shy of five weeks after his election, Kennedy prepared for church during an extended family vacation in Palm Beach, Florida. Pavlick loaded a 1950 Buick with seven to ten sticks of dynamite attached to a detonation device and watched President-Elect Kennedy leave the Kennedy's vacation house on Sunday morning. Simplicity was the key to Pavlick's plan - in a world where suicide bombers were foreign on United States soil, Pavlick intended to ram his Buick into Kennedy's car and detonate the dynamite. The ensuing explosion would certainly have taken the lives of both men while destroying property for dozens of yards around the crash site. The sight of Kennedy's wife Jackie and children Caroline and John Jr., as they ran to the car to see their father off prevented Pavlick from carrying out his self-assigned mission. Pavlick only wanted to kill the President-Elect, not his wife or children, whom he believed innocent of any crimes. 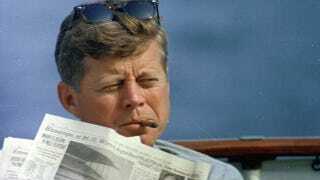 Pavlick did not abandon his mission, however, as he continued to stalk JFK while in Palm Beach, looking for another opportunity to kill the President-Elect. Pavlick searched St. Edwards Cathedral, looking for a a place to strike. Both Kennedy and Pavlick were in the house of worship at the same time on at least one occasion. Pavlick also monitored the actions of Kennedy's Secret Service agents, choosing stay in a Palm Beach motel within fifty feet of Kennedy's protectors. In the meantime, Postmaster Thomas Murphy learned that Pavlick purchased dynamite and alerted authorities. Secret Service agents found Pavlick four days later, when Palm Bach police stopped the elderly man for atraffic violation and discovered the dynamite, enough to take out a city block, still in the Buick. The story of the assassination plot never received the news traction it deserved, as the announcement of Pavlick's arrest occurred on the same day as a mid-air collision between two planes over New York City which killed 132 passengers and left a single, 12-year-old survivor. Pavlick's attempt did not faze Kennedy, and the family continued their vacation in Palm Beach throughout the Christmas holidays. Pavlick confessed to the plot to kill Kennedy, but never faced trial. Instead, he spent the next five years in a mental institution. Once released, Pavlick turned his eye to tormenting Murphy and self-published An Innocent Man Illegally Arrested Spent Six Years in Hell: an autobiography of his life and the true story of an illegal arrest, indictments, and false charges. Pavlick passed away at the age of 88, never spending a single day in prison for his plan to kill a president. Top image via the John F. Kennedy Presidential Library and Museum. Additional image of Kennedy in Palm Beach via the John F. Kennedy Presidential Library and Museum, newspaper image via the The Spartanburg Herald, with the 1950 Buick image via. Sources linked within the article.